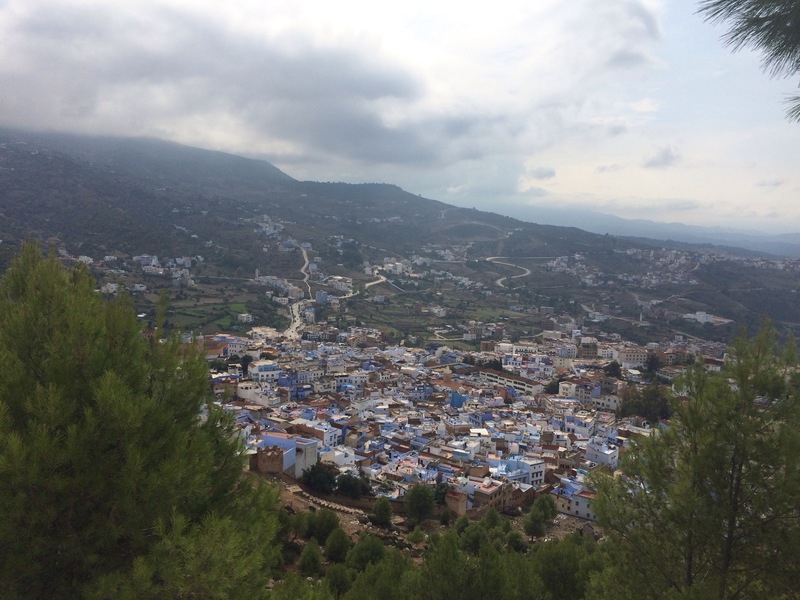 It was 22° when we arrived at the campsite high above Chefchaouen and we were soon relaxing in the afternoon sunshine, catching up on our pre dawn start that morning. Towards the end of the day when it was cooler we strolled down the steep hill to the town, wandering through the maze of ancient cobbled steps of the old city with its blue painted walls. We had a meal at a fish restaurant that served us with freshly baked bread, a super fresh salad followed by a plate of grilled fishes and calamari with rice and chips on the side – all washed down with a delicious chilled bottle of . . . . . . mineral water. We paid less than £8 for everything. We purchased return ferry tickets, costing €200, Algeciras to Tangier Med, from a booth on a retail park near the port. Ferry passengers were allowed to spend the night before travel parked up in the retail park. We chose to travel the following morning on the 6am ferry, which meant waking up at 5.45. It was pitch dark and somehow we missed the ferry port turning off the dual carriageway. We could see where we needed to be but ended up totally lost on an industrial area miles from anywhere. Fortunately we were able to switch on the TomTom navigator and we were soon back on the port road, arriving twenty minutes before the ferry was due to leave – plenty of time as the ferries never seemed to leave when they were supposed to. We docked at Tangier Med at 8 am as it was getting light. We had registered our passports with immigration during the ferry crossing and it took a further twenty minutes or so to clear Customs who didn’t seem particularly interested in us (we were aware we had more alcohol than we should on board). Once our paperwork had been checked the only thing they asked us was whether we had any “pistoles” which we took to mean guns. 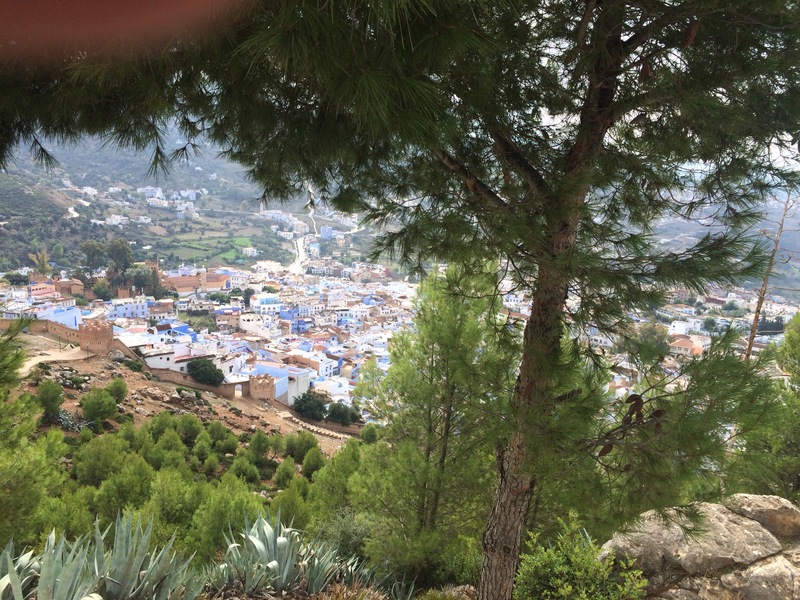 We were soon on the road heading south for Chefchaouen high in the Rif mountains, due south of Tangier Med. The drive was only about 70 miles but it took several hours as the road surfaces were dusty and often uneven and, if you were travelling too fast and hit a rough patch, the contents of cupboards rattled and crashed alarmingly. We also had to negotiate herds of goats at the roadside, stray dogs everywhere and heavy lorries hurtling towards us in the middle of the road as well as cars overtaking at breakneck speed on blind corners. We drove very carefully. It was a beautiful drive in glorious sunshine up into the Rif mountains. November 2012 was the first time we took our campervan to Morocco, travelling as part of an organised group. At the end of that tour we travelled independently for a week or so before returning to Europe. In April 2014 we returned to Morocco, again as part of a group but spent some time when the tour was over exploring on our own. For our third visit we would be travelling independently for the entire trip, albeit revisiting places we had already been to as well as discovering some new destinations. We left UK via Eurotunnel in mid October, stopping off overnight at Le Mans, Bordeaux and then Narbonne. Most of the French camp sites were due to close towards the end of October and those that were open didn’t offer us much of a welcome. We hurried through France on to Spain where, with the warmer weather, many of the Spanish sites remained open all year. We stopped on the Mediterranean coast at Benicàssim, south of Barcelona and at Mazarròn, south of Alicante. 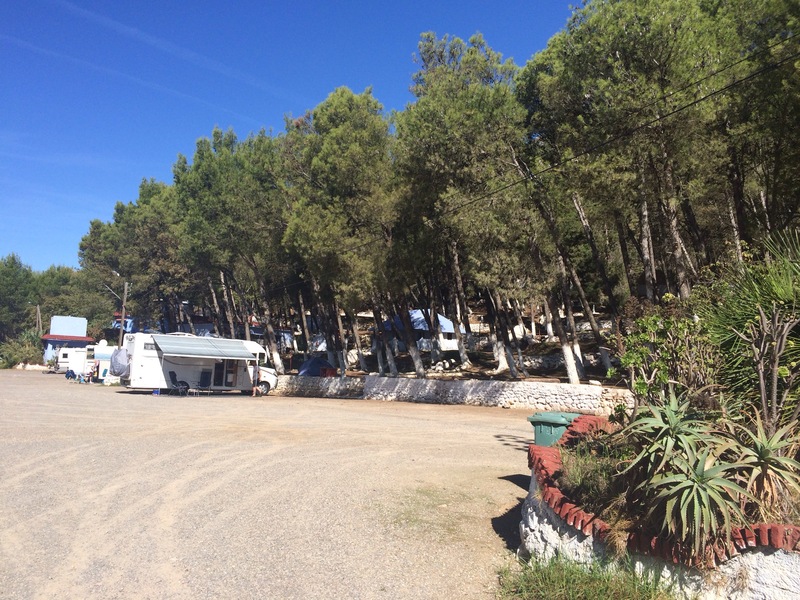 The majority of guests on both sites were over 60s Northern Europeans spending their winters in Spain. They had a sociable lifestyle in the balmy climate, filling their days with classes run by the camp such as Spanish lessons, Pilates and Aqua Gym. We felt a bit like gate crashers at a private party but we did gain a little kudos when they heard we were heading for Morocco. There were several sharp intakes of breath – You Are Brave and Is It Safe?. We were quite relieved when it was time to leave them to their sybaritic existence and head for Africa.